Just months ahead of the 10th year of Jazelz, I made the desicion to re-brand the look and feel of the Jazelz brand. Heres why…. In 2007 I set up ‘Jazelz’, a contemporary girlswear brand with a lifestyle designed eclectic collection with a unique approach. Oering easy to wear, comfortable Asian fusion clothing for girls from Baby to 12 years. Each style was bold, full of colour and the logo had a young fun vibrant look and feel. As the years progressed so did the Jazelz brand and the special occasion and Flower Girl dresses evolved. With these new product lines and the brand moving into other product categories, the descion was made to rebrand Jazelz and focus on sophisticated Luxury Girlswear. I worked on the new brand focus and researched graphic designers who could make my new vision come to life. Through word of mouth Mandy from Number/12/creative was highly recommended and with the talented Mandy, ‘Jazelz’ was rebranded. Mandy understood the direction and creative brief and delivered a clean modern copper logo which answered the new brand focus of Mini Fashion | Lifestyle | Accessories. 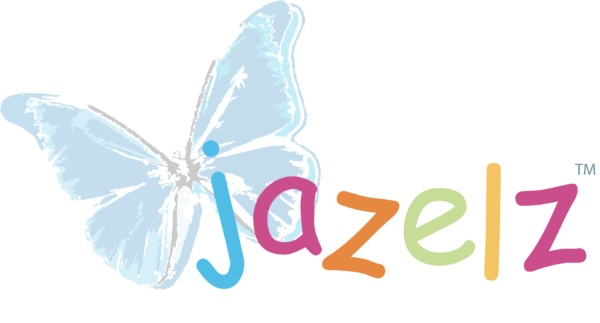 The new logo has been echoed throughout the ‘Jazelz’ branding from the letterpress business cards,stationary, swing tags, back neck woven labels, and the newly launched website. Mandy has also designed the look and feel of the new website which I am supa excited about.